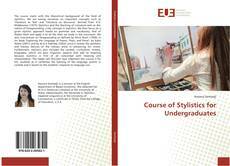 The course starts with the theoretical background of the field of stylistics. We are basing ourselves on important concepts such as ‘literature as Text’ and ‘literature as discourse’ derived from H.G Widdowson (1975) Stylistics and the Teaching of Literature and on the notion of Foregrounding, a key concept in stylistics. We then focus on a given stylistic approach based on grammar and vocabulary, that of Walter Nash and apply it to all the texts we study in the classroom. We also concentrate on foregrounding as defined by Mick Short (1996) in his book "Exploring the Language of Poems, Plays, and Prose", by Katie Wales (2001) and by M.A.K Halliday (2002) since it reveals the aesthetic and literary devices of the literary artist in enhancing his vision. Furthermore, stylistics also includes the context: civilization, history, biography, which are para linguistic aspects that add to meaning because stylistics is first of all concerned with meaning and interpretation. The reader will discover how important this course is for EFL students as it combines the learning of the language system in context and is based on the students’ response to language use.